You may be living with diabetes, but that's no reason to deprive yourself of dessert. After all, sweet treats don’t have to be loaded with added sugars; they can actually provide some nutritional benefits while still tasting totally decadent. Intrigued? Read on for seven delicious and good-for-you desserts made with just three wholesome ingredients. All you have to do is make room for the calories and carbohydrates within your overall meal plan. Then, stick to one serving and savor every bite. 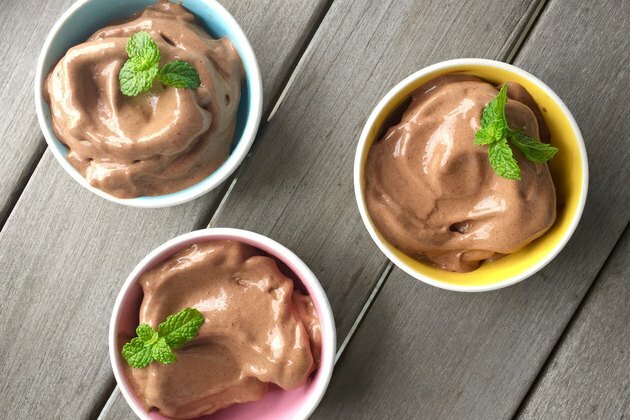 You can get all of the sweet taste and creamy texture of ice cream in a diabetes-friendly way thanks to “nice cream.” For this refreshing version, peel, slice, and freeze a couple bananas. Next, whirl them in a food processor with unsweetened cocoa powder and a few drops of pure peppermint extract until velvety smooth. The dish counts as a fruit serving, yet it’s all dessert! Energy balls are quick snacks that can do double-duty as nutritious treats to satisfy a sweet tooth. 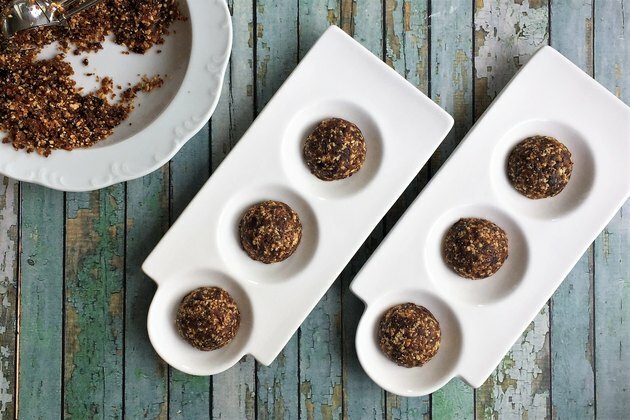 But unlike store-bought versions which can be high in sugar, these round bites contain only peanuts, cacao nibs and dates. (Added bonus: Research has shown that dates are not a high glycemic food!) Shape your ingredients into buttons rather than balls — just to be different — and enjoy them straight from the freezer for a frozen candy bar-like texture. Whipping cream may be the base of most mousses, but it’s nowhere to be found in this inspired take on the French classic. The velvety texture comes from avocado, giving this dessert healthful monounsaturated fats, which may help in managing blood sugar and insulin levels. Plus, several studies suggest that avocado provides an anti-diabetic effect. 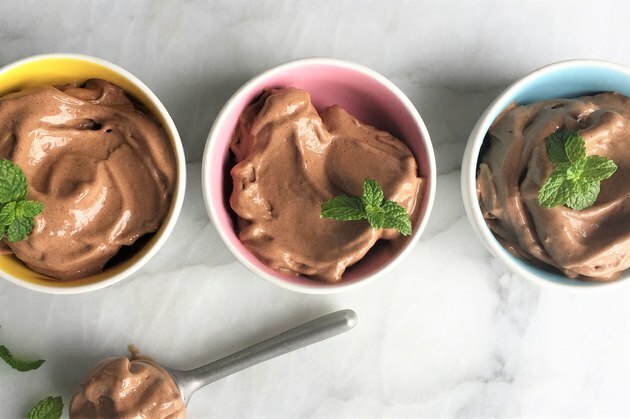 Whip the avocado in a food processor with 100 percent raspberry fruit spread and unsweetened cocoa powder, and you’ve got dark chocolate-raspberry “mousse”! 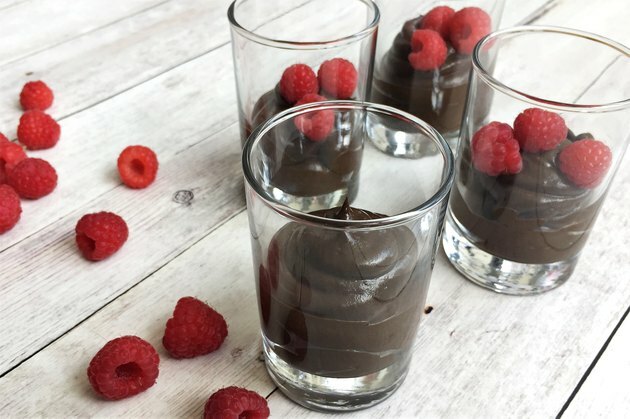 Recipe + Nutritional Info: Dark Chocolate Raspberry "Mousse"
Make fruit the star of your sundae! 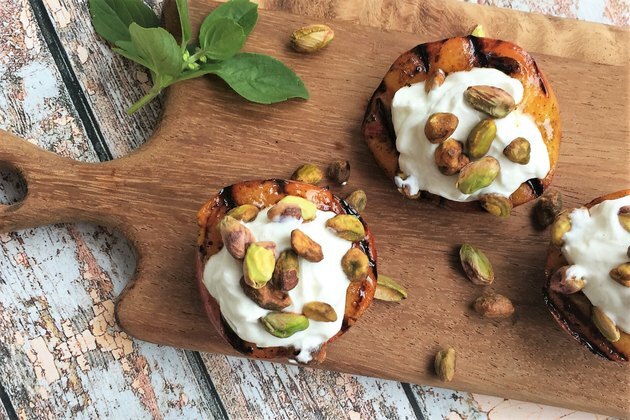 Grill the nectarine halves to warm them up and enhance their natural sweetness. Next, add cool and creamy plain Greek yogurt, and top with crunchy, roasted pistachios. If possible, opt for grass-fed Greek yogurt since it contains more conjugated linoleic acid (CLA) than conventional yogurt (studies suggest CLA may be better at regulating blood sugar). But don’t overthink it, eat it! You’ll adore the contrasting tastes and textures of this nutrient-rich dish. 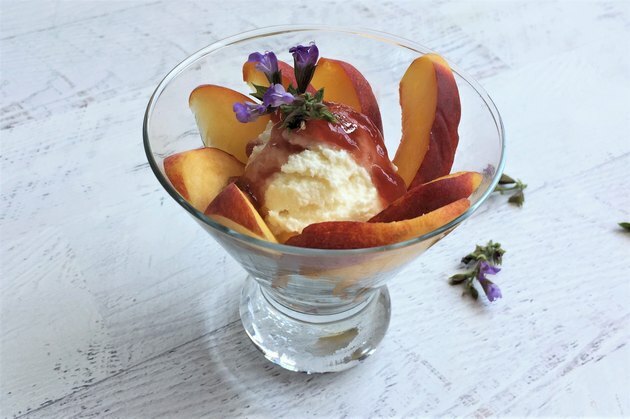 Recipe + Nutritional Info: Pan-Grilled Nectarine Sundae "Cups"
Bake a batch of homemade cookies — no butter, flour, or sugar required. These treats contain three ingredients you may already have in your kitchen: banana, almond butter and oats. While you may be tempted to add other cookie-friendly ingredients, like chocolate chips, to the batter, try this basic recipe as is first. 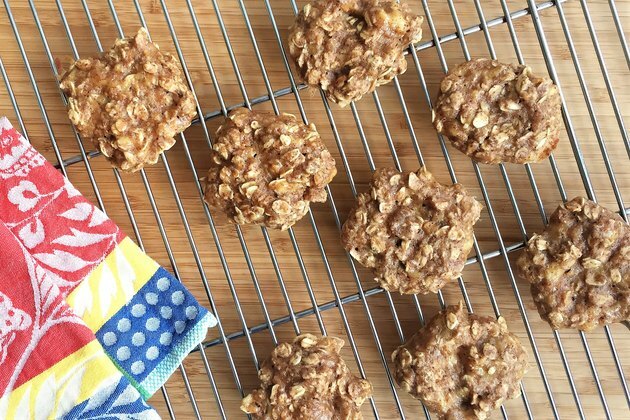 Each two-cookie serving is a good source of dietary fiber, while the soluble fiber in the oats can play a key role in helping to regulate blood sugar levels. So how do the cookies taste? Like healthy banana bread! If you’re looking to add a gourmet touch to your post-dinner fare, then this recipe should fit the bill. 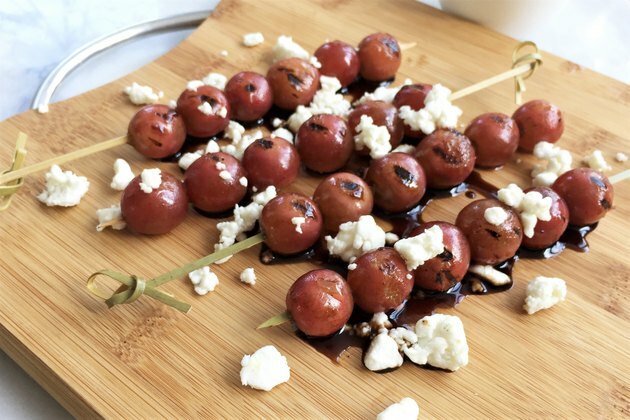 It pairs grilled red grape skewers with aged balsamic vinegar and crumbled goat cheese for a dessert that's as tasty as it is elegant. 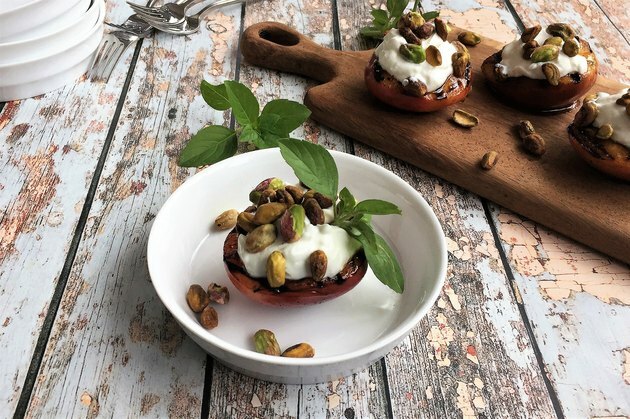 The grapes provide a low glycemic load (along with beneficial polyphenols that may potentially reduce high blood sugar), while the aged balsamic vinegar and goat cheese add a touch of tartness to delight your taste buds. Martini glasses aren't just for martinis. Skip the vodka and serve a parfait instead. To make this dish, layer thinly sliced peach halves into glasses, topping each with a scoop of ricotta cheese, and then drizzling on warm raspberry syrup (made by simmering 100 percent raspberry fruit spread for a couple minutes). The peaches contain ellagic acid, which has antioxidant properties that may play a beneficial role in chronic diseases like diabetes. Cheers to that! Do you skip dessert most of the time? Why or why not? What’s your favorite diabetes-friendly dessert? Leave a comment below and let us know!